Words like “cheeky” and “cute” float to mind whenever the Smart ForTwo rolls into view. Bright yellow paint only amplifies the effect, making the car look like a four-wheeled cartoon Minion, complete with goggle eyes and wide plastic grin. 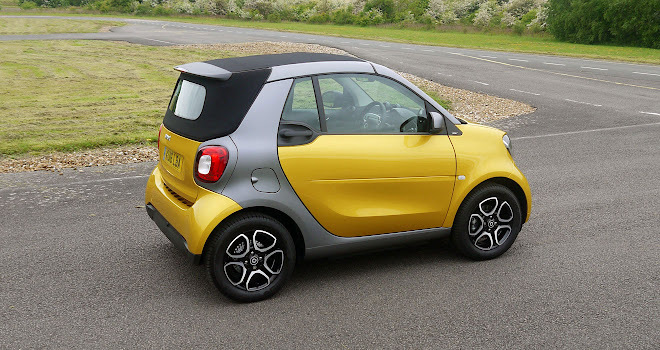 Perhaps it’s the button-nosed bonnet, but the latest Smart ForTwo does seem to look more toy-like than the previous generation. This is despite surface styling that seems to have been designed to mimic conventional stamped steel bodywork. As with earlier Smarts, the bonnet, wings, doors and boot are actually skinned in plastic. Only the pillars painted matt grey in the pictures feel cool to the touch. 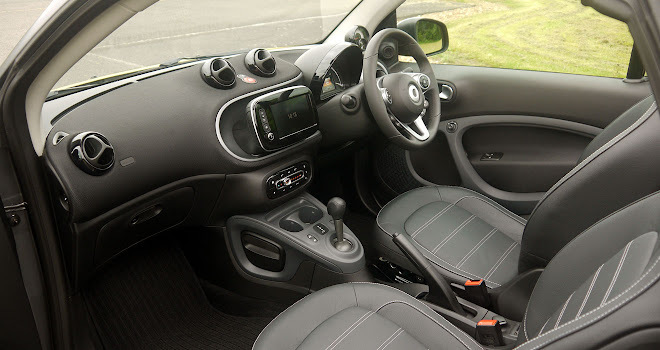 Compared to the previous ForTwo, the current car also has more laid back and horizontal lines, giving a friendlier feel. 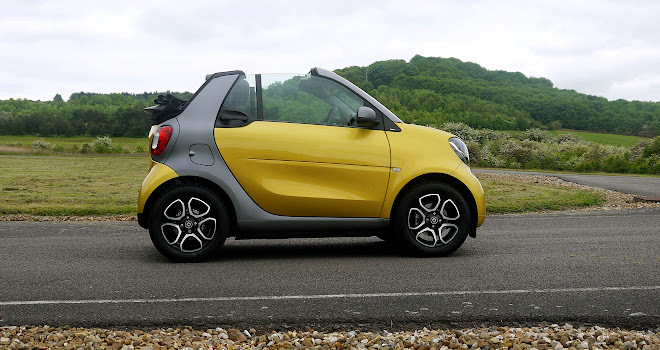 During my week with the car it certainly seemed to instil warm feelings among other road users – if you hope to be waved out of side turnings onto busy roads, a new ForTwo is an excellent choice. This particular example is the Cabrio edition. It costs £2,140 more than a fixed-top ForTwo, model for model, and features a powered fabric roof that will zip all the way back in two stages. First the overhead fabric concertinas back, and then the glass rear screen tucks out of the way as the roof chugs down the rear pillars to nestle in a neat(ish) pile above the bootlid. You can halt the roof partially open if you wish. Peeling back the top section but leaving the rear part upright provides an appealing combination of fresh air and rear vision. A completely folded roof fills up the lower half of the rear-view mirror, though that’s actually a pretty good result for this kind of convertible. 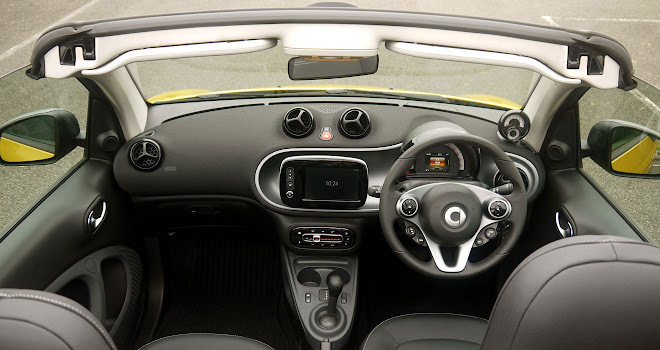 In the DS 3 Cabrio, for example, the folded roof blocks off the whole of the mirror. Fully opening or closing the lid takes about 13 seconds and requires a consistent prod of a button down by the gearstick. A quick press to open or close would have been handy but isn’t on the menu. A button on the car’s keyfob will, interestingly, peel back the roof even when the car is locked. Presumably that’s to let out hot air as you approach the car. Hot air was rarely an issue for me. Instead the British weather favoured monsoon grade rain for much of my test, which at least helped me confirm that the hood is impressively weatherproof. Twin spars connect the rear hoop to the windscreen and can be left in place or can be unclipped and stowed in the boot, for a full al fresco feeling. Replacing the spars is easy – they slot home at the front and latch into place at the rear, though it tends to feel less like a breeze in a sudden downpour. Stowing the spars in the boot can feel like a logic puzzle. They fit snugly into receptacles in the fold-down bootlid but I found myself turning them this way and that to work out which one fits in which slot. Once ensconced they are lashed into place with straps, taking up a slim slice of boot space when the tailgate is finally slammed shut. The boot itself is on the small and shallow side, at 260 litres. Of course that’s partly because there’s an engine in the back of the car. It lives under a metal bulkhead, beneath the foam-backed boot carpet. 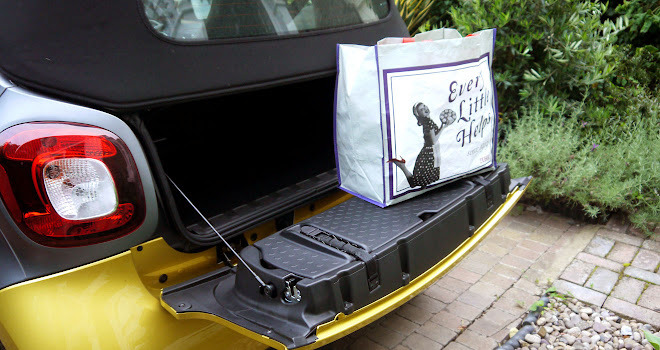 The boot opening is too tight to accept an average bag of groceries, though you can reach in and unclip the base of the hood. The rear section of hood then helpfully snaps up out of the way, giving much better access to the luggage compartment. A miniature rollerblind cover and fabric partition are all that separates the boot from the cabin. The divider can be unclipped and the front passenger seat folded to accommodate longer loads, up to about 1.5 metres long. It’s worth remembering that the entire car is only 2.7 metres nose to tail, however, so if you play the double bass you might want to shop elsewhere. Assuming you haven’t just done a week’s shopping, the cabin feels reasonably spacious for two. It’s neatly designed with characterful touches – eyeball air vents, a rev counter pod on a stalk and sliding rather than rotary ventilation controls. The dashboard top is covered in stretched fabric, which provides an attractive surface with a high quality feel. Everything seems solid and neatly assembled. Stowage is in short supply, however. The lockable glovebox should easily accommodate a glove but probably not two, there are smallish door pockets, miniature cupholders, a tiny drawer on the passenger side of the centre console big enough for a charging cable or two, slender seat-back map pockets and that’s about it. 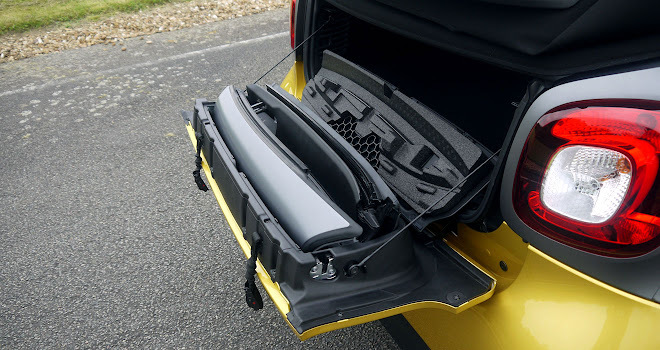 There is, however, a third cupholder behind the handbrake, which is either a sign that you can carry an extra person in the boot or that the same plastic moulding is used in the Smart ForFour. Under way the first thing that strikes is the quickness of the steering, and the car’s remarkably tight turning circle. To say that the ForTwo turns on a sixpence probably gives a false impression of the size of old coinage. You can spin around in places where it seems a unicycle would need to do a three-point turn. The ForTwo is of course a doddle to park, and it’s pleasingly easy to find half-spaces big enough to squeeze into on even the most packed urban street. 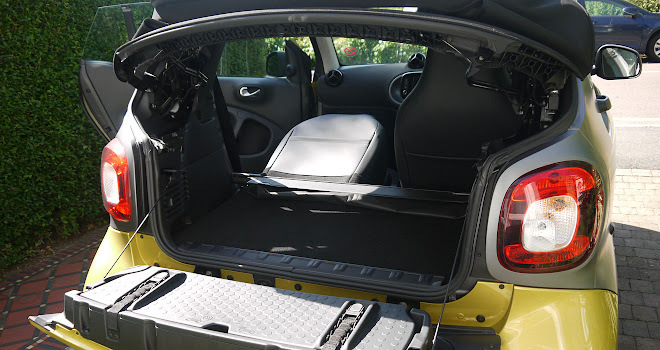 The 999cc engine in the boot produces 71bhp and will whisk the car to 62mph in a not especially brisk 15.5 seconds. That sluggishness may be down to the six-speed dual-clutch transmission in the example pictured, which I would never accuse of being quick witted. It is, however, a genius compared to the head-scratching semi-auto fitted to the previous Smart generation. The three-pot engine note is an appealing sort of warble, which is just as well given that you hear quite a lot of it. The car can also be fond of the shimmies and shakes until the oil has warmed through, although vibration quickly falls away as you speed up. Stop-start is also fitted as standard, which in the automatic version I tried shuts the engine down at a standstill but restarts it again as soon as you step off the brake. The ride can be choppy but that’s to be expected with a wheelbase less than 1.9 metres. You’ll need to slow for speed humps unless you enjoy being bounced in the air. There is a softness and even a bit of roll to the suspension, however, which keeps things reasonably comfortable in the city and could be classed as entertaining in the countryside. Motorway manners are surprisingly refined, assuming the roof is shut. Yes there is plenty of wind noise and tyre roar, but that’s because it’s a soft-top car featuring four wheels unusually close to your ears. Engine noise gets left behind at speed, however, and the car has enough pace and presence not to feel threatened by larger vehicles. I found the seats very supportive, making it easy to emerge from a few hours’ cruise feeling acceptably fresh. Cruise control is not adaptive, alas, but you can pay for a front sensor to scold you for tailgating. The £795 premium package applied to my car included a seven-inch touchscreen with smartphone mirroring, which was impressive aside from the fact that my hands on the wheel tended to obscure the nearest third of the screen, which was a pain in satnav mode. The steering wheel adjusts up and down but not in or out, making it hard to find a position where I was comfortable but could still see the map. The official fuel economy figures are 65.7mpg and 99g/km of CO2. 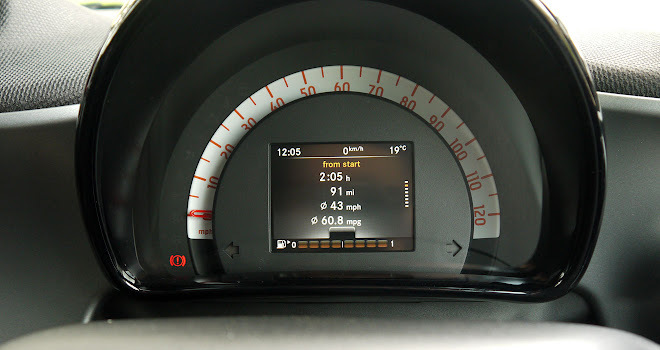 Across a week’s motoring that included urban pottering and a couple of hundred miles of motorway, I achieved over 60mpg according to the bright little screen in the middle of the instrument panel. 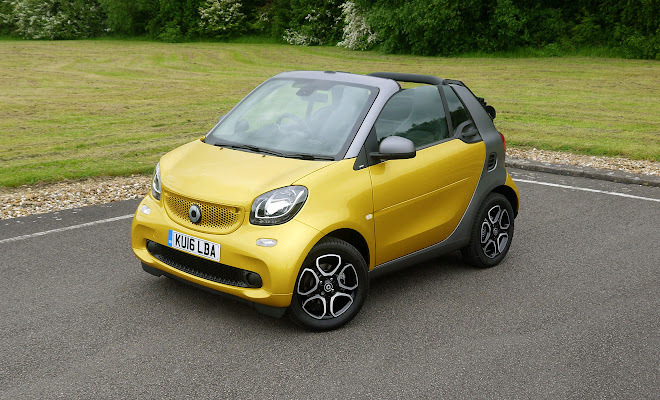 If all you need are two seats, the Smart ForTwo is a very cheerful little option. 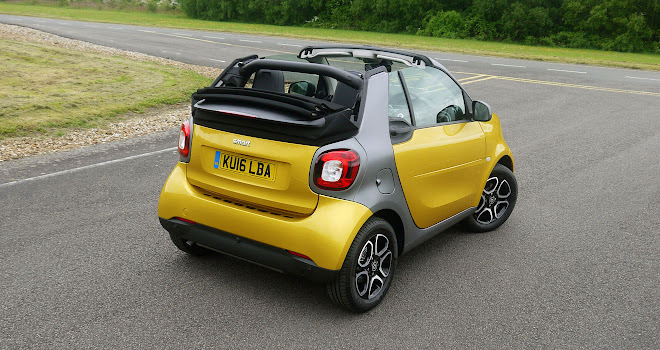 The fabric roof adds plenty of appeal if you enjoy open-topped motoring, though opting for the Cabrio does add a large percentage to what is otherwise a relatively inexpensive car.